In part one of this article, I looked at three big mysteries surrounding the kimono. I also hinted at a fourth mystery, which is perhaps the biggest one of all: how this traditional form of clothing has persisted through to the present. Here, in part two, I hope to provide plenty of new insights for both Japanese and foreign readers. The kimono has partly disappeared from Japanese society, but simultaneously remains deep-rooted. What I mean by this is that while the kimono is no longer worn as an everyday form of dress, it is still worn as formal attire for special occasions. 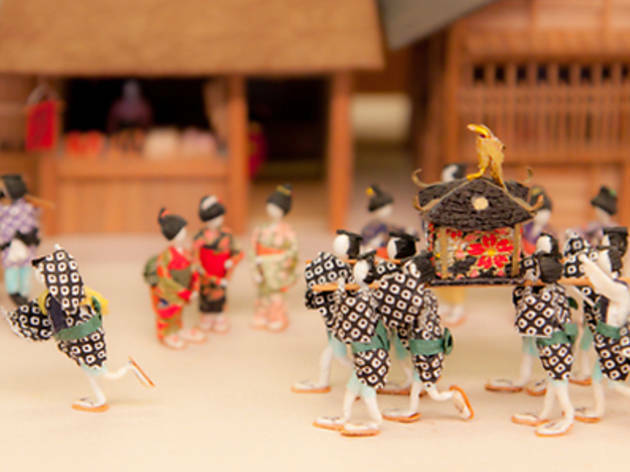 As I mentioned in part one, women often receive expensive kimonos as gifts from their parents and wear them at ceremonies such as Coming of Age Day and weddings. Although not to the same extent as women, men also don these increasingly rare garments on formal occasions, including New Year’s Day. As for why the tradition has changed, we need to begin with an admittedly rather sociological discussion on the meaning of clothes to us humans, so do bear with me. Putting aside the question of whether clothing originated as a means of keeping us warm or as ‘fig leaves’ to cover our private parts, we know that early clothes were made of fur, bark and other ‘flat’ materials that made covering the entire body difficult. Although this allowed for plenty of ventilation, the gaps also robbed the body of warmth. By contrast, the ancient Roman toga and the Indian sari were far more functional, draping the entire body and making use of convenient fastenings or ties at the shoulder. Advances in sewing with needles and thread led to ‘three-dimensional’ clothing, for example, round armholes and fitted shoulders. While Western clothing evolved through such techniques, the kimono remained a ‘flat’ form of dress and took the ancient idea of two-dimensionality to masterful heights. This is evident when one looks at a properly folded kimono, which forms a single, perfect rectangle (see video). All kimonos are cut in this identical form. But how, then, are some of the typical problems of ‘flat’ garments, including gaps between the cloth and the body, solved in the case of the kimono? Slippage is prevented by the obi, a piece of material used to securely fasted the kimono at one’s waist, while the cold can be dealt with by wearing multiple layers of material on top of each other. Conversely, the kimono is worn more loosely during the summer heat, allowing a slight breeze to pass through and keep the wearer cool – women’s kimonos even have openings in the sleeves, allowing extra air in. Summer kimonos, like the hitoe, are made of a single, unlined piece of cloth, ensuring the best possible ventilation. Tricks like these seem to resolve most of the issues caused by the kimono’s lack of flexibility, but the problem of limited mobility still remains. Anyone who’s worn a kimono will know the feeling of being bound up in a piece of cloth and not being able to move freely. Engaging in any kind of physical work or other activity while wearing one is next to impossible. To overcome such limitations, a wide range of techniques has been developed. The kimono can be thought of as consisting of two halves, with the obi marking the point where these come together. Opening or removing parts of the upper or lower halves of the garment, while leaving the intricately tied obi in place, increases freedom of movement. Because the kimono is usually folded to fit tightly on the upper body, improved arm mobility is achieved by slipping one sleeve off the shoulder (called kata-hada or ‘bare shoulder’). If this is still too restrictive, one could slip out of both sleeves (moro-hada or ‘both shoulders bare’). The sleeves can then be tucked into the obi to prevent them from getting in the way. On the other hand, if one needs to increase lower body mobility, one could grab and raise the front part of the hem, allowing for a wider step. If running is called for, the back hem is lifted and tucked into the obi (shirihashori, pictured). The above techniques were once considered basic manoeuvres that allowed the kimono wearer to relax by undoing the form of the garment and adjusting its tightness. One could also use a long piece of cloth known as a tasuki to tie up the kimono sleeves at the shoulder, ensuring unimpeded movement. Looking at depictions of daily life in the Edo period, such as those by famed ukiyo-e artist Hokusai, we see people engaged in physical labour, including bucket-makers, boatsmen and couriers, always unfolding and rewrapping their kimonos as necessary. If this still wasn’t enough, or the garment felt unbearably hot, men would remove it entirely and keep working in their loincloths (fundoshi). Although the loincloth is a kind of underwear, its use in public was allowed – just look at sumo wrestlers. Of course, the above mainly applies to men. In terms of modesty and exposing one’s skin, what was permitted for women was traditionally very different: a woman could not, for instance, remove both kimono sleeves without attracting attention. Due to such limitations, women devised their own methods of adapting the kimono for comfort. 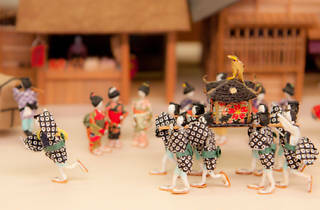 They would hold the hem when walking to allow for longer strides, and used the tasuki to free their arms when working. In hot weather, women would loosen the top half of the kimono to allow for air to pass through, or even push the fabric up around the neck and fold it in, producing an opening from the back of the neck and towards the back. When breastfeeding, women of course also loosened the front of their kimono, and most likely stripped out of their sleeves in private as well. In fact, foreign visitors to Japan around the end of the feudal era recorded their shock at both the way commoners walked around wearing only loincloths, and at how women had no misgivings when it came to showing skin. The techniques described here were all intended to overcome the kimono’s limitations as a ‘flat’ garment, lending freedom of movement to the wearer and allowing for adjustment according to temperature while upholding society’s modesty norms. When Western clothing later became more prevalent, Western standards of modesty were also adapted, leading to the decline of techniques like stripping out of one’s sleeves or tucking the hem. Similarly, going through the trouble of dismantling one’s kimono and tying up the sleeves with a tasuki came to be seen as inconvenient when compared to the ease of wearing shirts and trousers. This meant less and less people wore kimonos, which in turn meant less people employed the techniques discussed above. This trend has continued up to the present, with hardly any Japanese people wearing kimonos in daily life today. Nevertheless, the kimono retains its cultural and historical value as a traditional form of clothing, and continues to be used at ceremonies like the Shichi-Go-San festival, Coming of Age celebrations, weddings and New Year’s events. In this way, it performs a function similar to the folk dresses worn by people around the world when celebrating traditional rites. This changed pattern of use has also resulted in the kimono becoming an expensive and luxurious garment, worn only for special occasions. At formal events, one rarely has to do any running or perform physical labour, so knowledge of loosening techniques and the like is unnecessary. It’s also easier to brave the cold or heat than attempt to undo the outfit. The kimono’s formal status has brought with it the notion that the garment must always look straight and proper, so people pay professional kimono fitters to adjust the fabric and use cords and fasteners to create a perfect fit. Such tricks ensure that the kimono retains its shape throughout the day. So, now you know why the kimono, once an everyday garment, is only worn for formal occasions in modern Japan. If you’d like to see truly traditional kimono-wearing, your best bet is to watch a kabuki performance: you’ll be able to glimpse actors undoing their kimonos on stage and refitting them the old-school way, upholding the beauty of techniques now unknown to most Japanese people. Tangible culture being lost is lamentable in itself, but I feel that the ongoing loss of intangible culture is a far more serious matter.